After two years pushing the creative edges, Tales From the Ultra Tribe emerges as a fire-breathing life form. The deep trance-shamanic-atmospheric collaboration between Steve Roach and Byron Metcalf evokes the primordial caverns and aeon-blasted landscapes of their groundbreaking The Serpent’s Lair (Projekt, 2000). It’s a lucid trance-groove experience, a searing combination of acoustic percussion and hyper-dimensional electronic rhythms. The Ultra Tribe are the future primitives: the future-tech foundation wrapped by the organic. It’s no longer clear where the human ends and the machine begins. The elements of this sound are Steve’s complex hybrid-grooves overlaid by Byron’s primal, fluid and organic – yet precise – frame drums and percussion. It’s an atmosphere of shifting soundworlds in which the forms of the Ultra Tribe exist. An alchemy of electronic sequencers, drum machines and percussion locks in the groove, while the human element jumps in and out of the steady pulse, giving the music a passionate intensity. The elements are deftly shaped to a point of complete integration where the final result is transformed into a living breathing body with an electro-organic soul. As one the original architects of the tribal-ambient genre, Steve Roach’s innovations are mapped out on the landmark albums Origins, Artifacts, and Dreamtime Return, along with releases from the Suspended Memories trio and the more recent Fever Dreams series. Similarly, Byron Metcalf’s tribal-shamanic albums Helpers, Guides & Allies, Not Without Risk, The Shaman’s Heart, and A Warning From the Elders, serve as a benchmark for deep journey exploration. In the late 90’s, Steve teamed up with Byron, and over the span of a dozen years they’ve created an array of releases that explore and push the outer edges of shamanic-electronic tribalism. 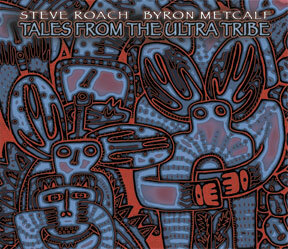 The electro-shamanic ritual continues on Tales from the Ultra Tribe, the new offering from Steve Roach and Byron Metcalf. Coiling up out of the same spirit well that has empowered earlier journeys–most notably the epic tribal-ambient work The Serpent’s Lair–this new release focuses less on ushering the listener into the lower worlds and more on sharing its power in an energizing, spirit-releasing way. This is a statement on the connection between primitive and modern, tradition and transformation. It is about trance states imposed equally by drum and drone and the way in which that thing, that ancient thing inside each of us, can be called and awakened by either. The format is familiar; Metcalf’s thunderously potent drum work, his rattles and shakers and pots, set up our collective pulse and Roach conjures a mist of sound that tells us how and when to breathe on our journey. As the disc moves along, Metcalf the traditionalist and Roach the technologist switch places at the helm. At first, it’s largely Metcalf’s show because we need to be called into ourselves, and the drums are the way in. The 13-minute “Setting Forth” is packed with medicinal percussion; Roach’s sounds gather and curl like stormwinds. This eases out into “A Noble Direction,” pushed ahead by the deep resonance of Metcalf’s frame drum. There is a point here where, for just a few seconds, everything drops out except for one pure-pulse beat on the drum. It doesn’t last long, and I wish there was more of it, but it’s an incredibly effective thing where your head just empties out and there’s just you and this simple sound connecting you to the flow. And then you’re back in it, moving into Roach’s domain for “Midnight Migration.” Here’s the first switch from tribal to tech, a transmutation that doesn’t lose any of the preceding potency as analog synths take over the role as guide, curling into distinct trance formations and adding a bit of bouncing groove. Metcalf’s drums continue to call thunder into the mix. They swap back for “Magma Clan,” where the shadows roll in, distant didgeridoo sounds haunt the backdrop, and the drums grow thick and intense. Just when it’s looking a little grim, “Road From Here” amps up the energy, a high-BPM churn of drum and guttural snippets of analog that should set your heart racing. If that doesn’t do it, the massive drum slaps late in the track will. By the time “Fire Sky Portal” and “Return of the Dragon Bone Clan” roll around, your mind should be suitably melted and set free; “Clan” in particular continues into a trance zone fueled again by the drums. Roach’s synths hiss and spit in the background, burrowing fresh tunnels into your head. At last you’re left to sit in the comparative quiet of “In the Safety of Travel,” cool down and come back to start again. Whereas Tales from the Ultra Tribe has been noted as taking its cue from Serpent’s Lair, or being the descendant thereof, I came into it expecting more of Roach and Metcalf’s excellent “let’s go to the lower world” excursions. But Ultra Tribe is a thing all its own while nodding openly to its lineage. It is an exhilarating tribal ride that doesn’t head into dark zones but rather infuses the listener with soulful energy and a sense of release. That being said, if drums aren’t your thing you may have a harder point of entry–because that’s what this disc is about: the ritualistic, mind-opening, trance-instilling power of drums. But as they take hold, they simply melt into the organic whole of the thing, amplified by classic synth work from Roach, and it’s not as though you’re going to be in your body for the entire ride anyway. Get the headphones on, lay down somewhere quiet, and take this journey. Another strong dose of sonic medicine from Roach and Metcalf. Longtime collaborators Steve Roach and Byron Metcalf first pooled their respective talents in 2000 for The Serpent’s Lair and have continued to do so repeatedly in the years since, with the recorded output sometimes featuring a third member such as Mark Seelig or Dashmesh Khalsa. Tales From the Ultra Tribe could, however, be seen as the long-gestating follow-up to The Serpent’s Lair, given that Roach and Metcalf share equal billing and are the musicians solely responsible for the seventy-four-minute journey. The accompanying press info characterizes the album’s sound as “shamanic-electronic tribalism,” and that’s probably as good a descriptor as could be provided for the material’s trance-inducing, electro-acoustic sound. Armed with all manner of percussive gear (frame drums, rattles, shakers, clay pots, etc. ), Metcalf takes care of the rhythmic side, while Roach deploys an array of synthesizers, drum machines, electronics, and other sounds to generate the dense, synthetic-atmospheric dimension. That Tales From the Ultra Tribe is intended to be experienced as a journey is indicated by track titles such as “Setting Forth” and “Road From Here” and by the tracks’ uninterrupted flow. Despite the fact that shifts in tone and atmosphere do arise (compare the hyperactive urgency of “Road From Here” to the languid humidity of “Fire Sky Portal” as one example), a fluid pulse is present as an undercurrent tying the eight tracks together. That Roach and Metcalf are long-time collaborators is borne out by the recording as it seamlessly blends their contributions and does so with a well-measured degree of balance: Metcalf’s primal rhythms are omnipresent but neither dominant nor submissive; Roach’s synthetic patterns and atmospheres are likewise prominent yet not so much so that they overwhelm the percussive sounds. Interestingly, the deep plunge into future-primitivism taken by the duo (especially on a representative track such as “The Magma Clan”) isn’t that far removed from the work Paul Schütze released during the mid-‘90s as part of Virgin’s Ambient series (1995’s Apart and 1996’s Abysmal Evenings) so listeners fond of that particular ambient-tribal style should find Tales From the Ultra Tribe to their liking, too. Born in 1955 and making music since he was 20 years old (inspired by Tangerine Dream, Klaus Schulze and Vangelis), Steve Roach has personally helped shape ambient music to become what it is now. He’s one of those extremely prolific artists: his discography boasts about 100 albums at the moment. He has worked together with many well-known musicians, and though his style may vary on each different release it is also very personal and immediately recognisable. With 40 years of musical experience, percussionist Byron Metcalf is not exactly a newcomer, either. “Tales from the Ultra Tribe” is their latest collaboration (released in conjunction with Steve Roach’s drone album “Soul Tones” , which showcases quite a different side of his music). The tense and suspenseful rhythms from these seamlessly mixed eight tracks immediately catch hold of the listener and don’t let go until the end, 74 minutes later. These musicians’ experience and craftmanship are clearly felt in the way the electronic layers, soundscapes and sequenced patterns, are delicately balanced with the incredibly deep (acoustic) percussion, with sometimes sounding like a (not very) remote earthquake. Steve Roach provides the perfect widescreen atmospheric surroundings for Byron Metcalf’s jawdropping percussion performance. Apart from being a professional musician, Byron Metcalf also holds a Ph.D. in transpersonal psychology, a master’s degree in counseling psychology – a “transpersonal guide and educator, shamanic practitioner, researcher, and teacher”. This may usually indicate entering musical ‘new age’ territory, which “serious” ambient electronic music listeners usually prefer to avoid. But do not make that mistake on this particular album: it has no trace of the ‘feel-good sounds’ (with oceans & dolphins) usually found on new-age albums. It has the strong atmosphere of a shamanistic ritual, but it’s brooding and tense in a way seldom heard. Exactly one year has passed since the phenomenal “Back To Life” 2CD by Steve Roach, which still deeply resonates with me. But now it’s time to celebrate another groundbreaker!!! Yes, though this time The Master is joined by his fellow Arizonian shaman Byron Metcalf, a ceremonial and therapeutic guide, for their 6th collaborative project (some of them feature also Mark Seelig and Dashmesh Khalsa), but both artists have joined their forces also on other highly notable works such as both parts of “The Shaman’s Heart”, three parts of “Fewer Dreams”, “New Life Dreaming”, “Live At SoundQuest Fest”… Profoundly magnificent “Back To Life” symphony is now shifted into a brand new level, a dimension emphasized by Byron’s virtuoso performance on various drums, shakers, rattles, udu, clay pots… Steve utilizes various analog and digital synths including Eurorack analog modular, sequencers, drum machines, didge, ocarina and mega waterphone. Yes, their previous mostly tribal shamanistic infused harmony is now bridged with deeply mesmerizing cyber-trance adventures. What a fusion!!! “Setting Forth” fires the journey up with rather more groovier high-spirited hypnotics, with less primal impact, more hidden by cyber-tech bedding. With nearly 14 minutes the longest composition. Psychoactive hybrid of ancient and future, a sonic realm of pure splendor and power, but that’s just the beginning!!! “A Noble Direction” kicks and both artists fully unfold their immeasurable wizardry. Vibrant tribal percussions with ultra monstrous beat are backed by flowing and ebbing immense and expressive wide-screen landscapes. And in about the middle of the track this tribal storm calms down and harmonious heartbeat of both shamans can be heard for 10 seconds, then this exciting journey again unwraps all its hyper-active rhythms. A truly mind-transporting experience presenting Steve & Byron at the very top of their creative and visionary capability, a Hall Of Fame cyber-organic sound sculpting!!! Quality pair of speakers or headphones are highly recommended for pure sonic bliss!!! “Midnight Migration” hauntingly blends lazy high-tech grooves with spiraling intense nocturnal soundscapes, later heavier tribals join and guide us deeper into primordial realms. Another brilliant tribal-groovy escapade!!! Illuminative shamanistic percussions lead “The Magma Clan” and remain in breathtakingly monstrous cave domains, perfectly displaying the new sonic terrains explored by these two sound curanderos. Tribal-trance expedition at its most organic, a true shamanistic powerhouse!!! “Road From Here” blasts with more minimal, but hyper kinetic cyber grooves and percussions, here and there joined by heavier tribal drumming. The last quarter slows down a bit and warmer panoramas pervade. “Fire Sky Portal” is surrounded by desert heat and involves array of cyber-tech embellishments, but also earthy infusions. Sparsely layered, but richly shimmering, with 4-plus minutes the shortest number. “Return Of The Dragon Bone Tribe” holds rather minimal signature from its predecessor, again more synthetic flavored than primal, capturing quite hallucinogenic mind-trip with its repetitive electro-organic pulses and breaths. Comforting expansive washes with gently distant grooves blanket the closing piece, “In The Safety Of Travel”, along with occasional primordial rumbles appearing towards the end when the journey slowly fades away and reaches the point where all originated. Wow, this is absolutely jaw-dropping listening experience!!! And of course work like this requires appropriate cover artwork, this time Ralph Prata from Bloomingdale, NY, who creates amazing sculptural concrete carvings, has provided stunningly gorgeous images (layout by Sam Rosenthal), exquisitely interacting with Steve’s & Byron’s extraordinaire cyber-trance-shamanistic performances!!! The limits have been pushed once again, a milestone!! !